The Tanoshiboy Chronicles: Design & Illustration Blog: Do You Need Friends in High Places? Do You Need Friends in High Places? I got a little busy there and it prevented me from blogging, but since I was blogging almost non-stop, for a bit there, I figured it would be okay. I took the weekend to think about this post and what the right color palette was going to be. I've done work recently where the color palette is limited to 4 colors or so, but I didn't want to do that this time. I'm not going to make this a how-to or suggestion post. I just want to share this illustration that came from the suggestion post that I did last. I named it "Friends in High Places" and it stars Señor Sasquatch and Cyclopee. I hope you like it, and I'd love to hear from you. I'm hard at work on the sketch inspired by my wife and will share that illustration asap. Also... I had a reader comment that the blog is too dark and that reading white text on a dark background is difficult to read. If you think so, I would definitely consider changing it. Let me know what you think and enjoy the illustration. Señor Sasquatch says "Have a bigfoot-sized week!" P.S. 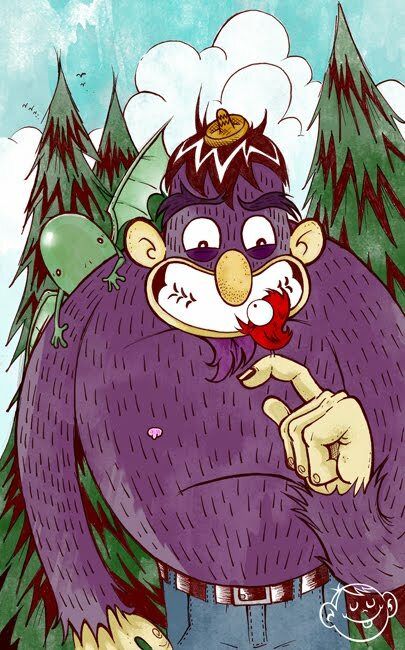 For those of you that are new to the blog... the little guy hanging on Señor Sasquatch's shoulder is Jimmy the Vampiric Lima Bean. He's just being nosey. Dude this is amazing. I love this style and I can read just fine. He was probably too old and couldn't see. lol. Can't wait to see the new one. Lovely work. I can see you taking chances. The dark doesn't bother me, but think about your readership I guess I'd say. Love the illustration. I can read it okay, but actually do not like white text on black background. Just personal preference as I find it rather cold which your posts and illustrations are certainly not. As a general rule white on back is harder to read. If you like the dark look take a look at TweetDeck. They use a grayer background with white which is easier to read. Test it out for yourself. Thank you ladies and gentleman. Hmmm... hootsuite looks almost as dark as mine. I've already mocked up a few ideas and will be changing the design this week regardless. The people have spoken. dude, the font is fine. How else can you make it anymore readable. and I love the color palete. This is nice man. I read it just fine. I like the look of the white on black but it's almost to the point where I do have trouble reading it. Love the finished piece. It reminds me of the old fashioned Max Fleischer style. Great! Thanks, Guiseppe! That's a huge compliment since I'm a big Fleischer fan. Looks great. And the blog looks good lighter. Good choice. Really cool illustration and really like the color palette!